It is sad to say this, but in this day of working with contractors…it is unusual for someone to do exactly what they commit to doing without multiple reminders. Thanks for being one of those special businesses that delivers what I paid for and follows through. Our garage is great! Before the Monkey Bar System was installed, my garage floor was cluttered with anything and everything. Now I can walk through the garage without tripping.” We have more room than we ever expected. I can see where things are now. The guys who came to install the system couldn’t have been nicer and more professional and got the job done as promised. The fact that we can add on to the current system as needs change was very important in making this decision. I love my garage now. Whatever your stuff is…recreational, gardening, lawn maintenance, kayaks, bicycles, etc. I had it all and it was in the garage. There was not much room for the car. Monkey bars came and conquered the unorganized mess. There is a shelf, hook, platform for everything imaginable. Thank you Monkey Bars! I first saw a Monkey Bar Storage System displayed while I was at a new homeowner gathering at our clubhouse, at the Colonial Heritage Clubhouse. At first I was a little skeptical, however, I invited them to my home the following week to give me a design and estimate. Was I ever surprised, my skepticism was quickly replaced with their solid recommendation of what I needed, and how it could transform my unorganized garage into a place for everything and everything with a place. I thought I would need more of the product than they actually recommended, they did not oversell their product, just what I needed. I was pleasantly pleased with the installation of my storage system, no longer did I have a garage that had such items as my golf clubs, bicycle and lawn chairs stacked up against the walls. Now all my items are handy to get to, while also completely out of the way so that I can get both our cars in the garage and walk around both of them. No longer do I have anything laying against the walls or trip hazards. The installation was done fast and professionally. There was no cleanup after the installation, in fact they helped to store everything that had been laying around the garage for years. 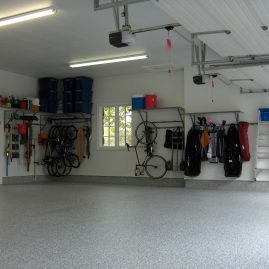 My garage is no longer an eyesore, but is neat, clean, and orderly, thanks to the folks at MonkeyBars Storage Systems. It is also easy to add new features to as you grow in your storage needs. Since my original purchase I have added two shelves and it will continue to grow as my storage needs grow. We could not be more pleased with our MonkeyBars storage system in our garage. I am extremely pleased with the Monkey Bars system. Rob was prompt, professional and did an outstanding job in my garage, he even helped me organize my garage after the job was done!. I looked at other systems out there and the Monkey Bars system fit my needs perfectly and at a much lower cost. For the first time in my life I now have an organized garage. For anyone who is looking to organize their garage, I highly recommend the Monkey Bars system. Just wanted to thank you again for the installation. The installers were very nice and the system is great. We can now park the car in the garage. What a difference! !